Where are all the new heroes? This summer, in particular, it feels like we're drowning in reboots. And a big part of our summer malaise has to do with the "copy of a copy of a copy" problem. But why is it so hard to create a new hero who gets some traction? I think it has to do with open-ended universes, and copyright law. How many superfamous new mythologies have been created in the past 20 years? Harry Potter comes to mind. So does Twilight. And probably The Hunger Games as well, at this point. Also, some video games, like Halo, Gears of War and World of Warcraft. And possibly Mass Effect. 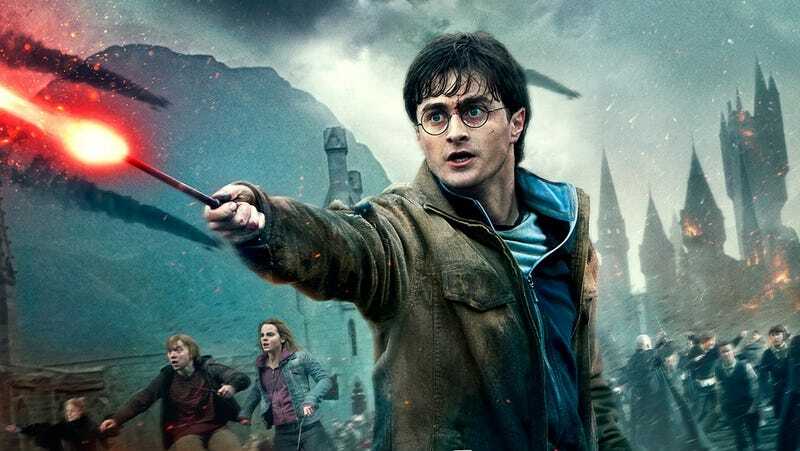 But the Harry Potter movies are done, and there are probably no more Potterverse books coming, either — which means that 20 years from now, Harry will probably be just another beloved, classic book series with a set of dated-looking movie adaptations. Ditto for Twilight, and probably Hunger Games too. Meanwhile, Halo novels regularly hit the bestseller list, but we still haven't had a Halo movie or regular TV show, and it remains to be seen how well video-game properties will age after another decade or two. So why is it so hard for newer mythologies to sink their claws into our brains, long term, the way Batman and Spider-Man have? Here are a couple explanations. Basically, Twilight, Harry Potter and Hunger Games are all just one story each, and when that story is over, the universe is over. Ditto with some classic source materials like Lord of the Rings/The Hobbit — witness Peter Jackson's attempt to turn The Hobbit into as many movies as possible. I wasn't reading the Harry Potter books that assiduously when they were coming out, and I remember being vaguely surprised that Harry was still fighting Voldemort in the third or fourth book, when my friend was reading it. For some reason, I thought maybe Harry would polish off Voldemort in book three, and then go on to fight a giant squid or something. The notion that Voldemort would be the only villain of the series hadn't quite penetrated my brain. The fact that these characters essentially star in one story, and then it's over, is probably a function of the fact that they were all created in books rather than, say, comics or television. Although there are book heroes who have more open-ended adventures, with villain after villain or arc after arc, I can't think of any of those who've had quite as much success as Harry or Katniss lately. The other thing that those three properties have in common, of course, is that they're more or less creator-owned — they're the property of J.K. Rowling or Stephenie Meyer, rather than a big entertainment conglomerate. And that means that nobody else can up and write a novel where Harry Potter fights a giant squid — at least, not officially and not for money. And meanwhile, Star Wars recently became much more open-ended when it passed from George Lucas' control to that of Disney. Star Wars always had its Expanded Universe, with bazillions of books and comics and games that supplemented the films. But the core story was just six movies, with a set beginning and end, and Lucas always swore he wouldn't let anyone continue that saga in movie form, beyond Return of the Jedi. Now, all of a sudden, the Star Wars universe is going to be more like the cinematic Marvel universe, with films coming out every year and the core canon opening out further and further — because of the power of corporate ownership, and the resulting drive to keep monetizing. Obviously, Batman partly endures because he's outlived Bob Kane and Bill Finger — but also, arguably, because he was being exploited by a corporation even while Kane and Finger were around, and that meant more stories and more visions of the character, early on. Unfortunately, corporations are good at taking an individual's creation and turning it into an icon, through endless franchising and variations and lines of hired-gun creators. But eventually, you do run into the "copy of a copy of a copy" problem, where variations of the same stories are being told endlessly. And outside of video games, corporations don't seem to be as good at creating the next Superman or James Bond — in the 1990s, there were fevered attempts to launch whole new superhero universes in comics (the Ultraverse! ), and also a bunch of space-opera TV shows, but nothing seems to have stuck. In the past decade, there have been some valiant attempts to launch new fantasy franchises. In 1976, the United Statesmassively extended copyright from 28 years (with one 28-year extension) to life of the author plus 50 years. Or a total of 75 years, for works created for hire. More recently, the term for "works for hire" was extended to 95 years. And arguably, that change in copyright law is the reason why so many of our biggest heroes are so old, and why the same stories get retold over and over. Corporations have way less incentive to try and create new characters when they still have some mega-popular ones in their stable. Can you imagine a world where Batman had become a public domain character in the mid-1990s? Maybe there would be whole new genres now, that don't actually exist in our world, if copyright had remained at 28 years plus extension. In the same way that one person created a superhero and everybody else scrambled to create their own superhero to compete, maybe if all the Golden Age superheroes had already gone out of copyright there would have been another, similar gold rush? Or several? But also, it seems at least plausible that a lot of characters would get a new lease on life from going into the public domain at some point — like, if Harry Potter went into the public domain after 56 years, maybe then we'd be getting some totally awesome stories about Harry Potter going head-to-head with the Doctor from Doctor Who. Maybe — and I'm just thinking aloud here — corporations are really good at developing these big characters into massive icons, using their incredible marketing and franchising powers. But maybe they're not so good at taking the crazy risks with a universe that's been around for decades and decades, and taking a character over the threshold from "beloved icon" to "myth who lives in the collective imagination." Maybe, by definition, a character can only become a legend when he or she belongs to everybody. Just a thought. Consider, also, that a ton of superheroes were created to copy Superman, or cash in on Superman's success. (And later, Batman and other characters.) Knock-offs and close approximations are how we get a lot of innovation in myth-making, after all. When you read about the genesis of characters like the Terminator or Wonder Woman, they often seem like they were born of chaos and desperation. And then at some point, the rough edges got filed off and that wild vision became a trademark. And the best stories are often the ones where these characters come the closest to being plunged back into chaos and desperation. That wild place where anything can happen is the crucible of heroes. Are we living in the Golden Age of Trash Culture right now?